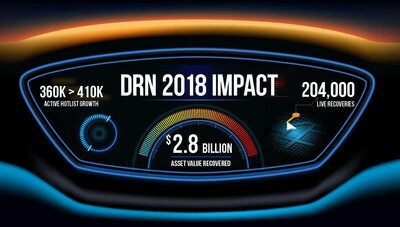 FORT WORTH, Texas, Dec. 21, 2018 /PRNewswire/ — Digital Recognition Network (DRN), an AI and data analytics company that provides vehicle location data and analytics to auto lenders, insurance carriers and other commercial verticals, today announced it has reached a critical milestone in its 10-year history as the company’s live hotlist has exceeded 410,000 License Plate Recognition (LPR) assignments, an increase of 33 percent over last year at this time. Additionally, our DRN affiliates have already attained more than 204,000 live vehicle recoveries year-to-date in 2018 on behalf of their clients. This equates to more than $2.5 billion in recovered vehicles for 2018, contributing to a total of $10.5 billion in recovered assets since the company’s inception. DRN is a leading provider of AI and data analytics to the Financial Services, Insurance and Asset Recovery industries. Our solutions enable our clients to more effectively optimize their portfolios, reduce losses, detect fraud, and manage risk. An industry pioneer in vehicle location data and license plate recognition technology and services, DRN covers every major metropolitan area in the United States and maintains the largest vehicle location database under strict standards of privacy, compliance, and data integrity. To find out more, visit www.drndata.com, or call (817) 877-0077.